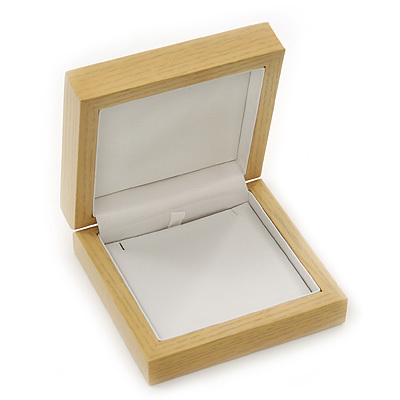 This luxurious Wooden Natural Pine Jewellery Presentation Box comes in yellow mustard colour and is most suitable for Long Earrings, Pendants and Brooches, but please check the internal box dimensions with your jewellery to make sure it fits. The box is made of genuine pinewood and finished with the lacquer coating. It has leather style white-coloured jewellery holder. It can be easily removed for trouble-free attachment of earrings, brooch or a pendant. The upper lid is covered with satin styled cushioned fabric and matches white colour of the jewellery holder. This box itself comes in a protective white cardboard box with a layer of soft porous plastic for extra protection from bumps and scratches. The box lid opens with reassuring tightness and closes with the sure "click". Internal measures: 8cm length, 8.5cm width, 1.5cm height in the lid and 1cm depth in the base. This Genuine Pink Wood Presentation Box speaks quality and luxury from every perspective and will surely add an exquisite touch for your precious brooch, pendant or earrings!